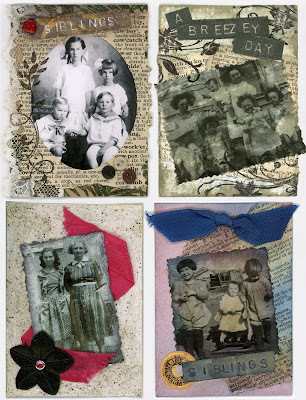 I have been busy doing ATCs for Teri's Ancestors Swap in our Paper Traders Group. These first three show my mom (Betty) as a baby, my dad (Forrest) with his two younger sisters (Berneice and Eulalia), then my mom and her sister Joyce with their puppies sitting on the running board of their car. This second group show first: my mom's 4 oldest siblings, then a group of my mom and her sister Joyce with their neices and nephew. Next is my mother with her mother (Leafy), and finally My mother as a baby with two of her brothers (Albert and Wilders). 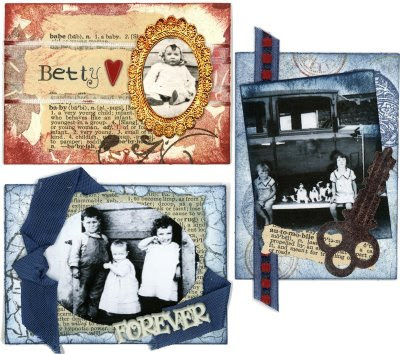 These cards were fun to make and brought back so many memories I have of growing up in a large extended family.